Remains an intriguing blend of the political and the personal, with Stone turning his memories and his opinions about Vietnam into potent drama. 120 min. Orion Pictures. Director: Oliver Stone. Cast: Tom Berenger, Willem Dafoe, Charlie Sheen, Forest Whitaker, Francesco Quinn. With only his fourth feature film (the first two being the horror cheapies Seizure and The Hand), Oliver Stone impressed the Academy big time, to the tune of four Oscars, including Best Picture and Best Director. Stone is the first to admit that 1986's Platoon isn't his best picture, but it remains an intriguing blend of the political and the personal, with Stone turning his memories and his opinions about Vietnam into potent drama. Stone begins the picture with the Biblical swatch “Rejoice O young man in thy youth…”and Samuel Barber's Adagio for Strings (also memorably employed by David Lynch six years earlier, for the climax of The Elephant Man), soon followed by the first of Private Chris Taylor's letters home to his grandma. It's September 1967, and Taylor (Charlie Sheen) is arriving—with Bravo Company, 25th Infantry—in Vietname, even as body bags get loaded onto their plane home. The casting choice of Charlie Sheen is, of course, loaded, since his father Martin Sheen starred in Francis Ford Coppola's Vietnan epic Apocalypse Now. Samuel Barber aside, Stone generally avoids the grandiose: his allegory for the war has the clean lines of a short story written from the point of view of someone who was there. Indeed, Stone was a Vietnam vet, and the callow Chris stands in for the director at his most impressionable. “Maybe I can see something I don’t yet see or learn something I don’t yet know,” Chris writes Grandma, and the film tells the story of his loss of innocence and journey of understanding. 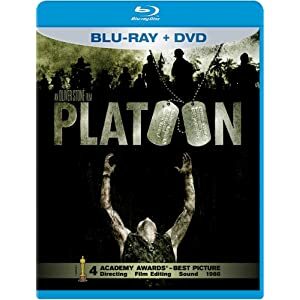 Platoon has a Hemingwayesque ring to it, in its investigation of machismo (the men in repose, save for Mark Moses' Lieutenant Wolfe, fall into the category of dope-smoking "heads" or hard-drinking "juicers") and in the concision of Chris' last words: “We did not fight the enemy. We fought ourselves. And the enemy was in us. The war is over for me now, but it will always be there the rest of my days.” Stone amplifies the sense of reportage with his eye for detail, in both critters (the jungle's mosquitos, leeches, ants, and snakes) and combat. Aided by military technical advisor Dale Dye (Hollywood's go-to guy ever since), Stone reset the standard for combat scenes with the film's blistering ambushes and firefights. Among the men Dye trained are plenty of familiar faces: Forest Whitaker, Keith David, John C. McGinley, Kevin Dillon, Peter Berg, Johnny Depp, Richard Edson, and Tony Todd. Though the narrative lines of Platoon are a bit simplistic, its standing as a veteran's view of the war gives it a special place among Vietnam war films. Chris mulls over the statement that “Hell is the impossibility of reason,” but Stone's hindsight perspective makes reason possible. Fox sends Platoon onto Blu-ray in a Blu-ray + DVD Combo Pack that offers improvements in image and sound quality. The leap up from DVD may not be quite so dramatic with this 1986 title, but I found myself surprised at how solid and clean and handsome the film appears. More importantly, there's no sacrifice to the image's film-like character: this is still Platoon, and it has an appropriately dingy look due to its limited color palette and creeping shadows. The most distinct differences in this transfer are increased detail and more discernable textures (facial pores, the terrycloth of Sheen's hoodie), but this is all-around good work on Fox's part. The lossless DTS-HD Master Audio 5.1 mix is likewise fairly humble, but representative of the original source material: surrounds are well-engaged, though it's not a wall-rattling kind of mix, even in the thickest of action. Bonus features round out the solid package, with one unfortunate omission. The excellent doc "A Tour of the Inferno: Revisiting Platoon," from the 2001 Special Edition DVD, has gone AWOL. But we still get the all-important audio commentary with director Oliver Stone, in which the always fascinating director lays down for the record his intentions and feelings about the film, and a separate audio commentary with military advisor Dale Dye, who keeps up a steady stream of observations and oral history of the production. Eleven “Deleted & Extended Scenes” (11:31, SD) come with optional director’s commentary. “Flashback to Platoon” (48:38, SD) isn't so much a retrospective of the film, as the title would imply; rather, it's more of an exploration of the Vietnam War experience, for veterans and civilians, and a consideration of how the film reflects history. Participants include Stone, Dye, A Rumor of War author Philip Caputo, UCLA history professor Mary F. Corey, former United States Senator Max Cleland, Harvard University senior fellow Marvin Kalb, producer Arnold Kopelson, editor Claire Simpson, Charlie Sheen, production designer Bruno Rubeo, special effects supervisor Yves De Bono, Vietnam veteran John Greer, Vietnam veteran Randy Dillenbeck, film critic Jack Mathews, Vietnam veteran Willie Wong, Vietnam veteran John Serrano, NYU associate professor Marita Sturken, and USC School of Cinema-Television professor Dr. Todd Boyd. In “One War, Many Stories” (25:32, SD), veterans reflect after a screening of Platoon, with film clips and comments by Stone interspersed, while “Preparing for the ‘Nam” (6:36, SD) comprises interviews with Stone and other veterans about their training experiences. Vignettes include “Caputo & the 7th Fleet” (1:38, SD), “Dye Training Method” (3:23, SD), and “Gordon Gekko” (1:06, SD). Rounding out the Blu-ray are three “TV Spots” and the “Theatrical Trailer” (1:44, HD). All site content © 2000-2019 Peter Canavese. Page generated at 04/20/2019 11:24:32PM.